Heineken has released locally (i.e., in the The Netherlands) a version of its famed beer which is kept cold from production until sale from the retail shelf. The beer is also protected from light by a special paper wrapper. Light can damage beer, particularly when stored in green bottles, although the effect is not invariable and seems in general to be less of a problem than it was. Still, any shielding from light is to be welcomed, an advantage draft beer has by its nature. Thanks to blog follower Alan in The Netherlands for sending me this and the image. The last time I had Heineken was in Montreal a few months ago, the standard green bottle. It was very good, no hint of light-struck character or a weedy, skunky taste. It was clean and fresh-tasting with good sweet malt and noticeable hops. Heineken is 100% barley malt. About twenty years ago, the company abandoned the former formula which incorporated some grain adjunct (unmalted corn or another grain). 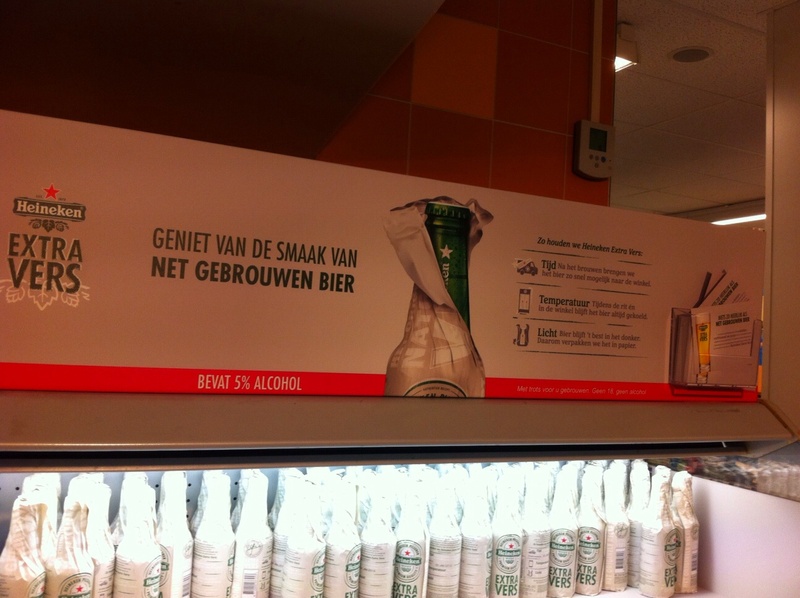 This was a smart move by Heineken, a far-seeing step that has IMO kept the beer front and centre in the quality ranks. This new version should be even better. It would be interesting to have a comparison from someone in the country, old bottle vs. new. A blind test would be even better. One question I have is whether the new wrapped one is pasteurized. I would think not, given the end-to-end refrigeration and if so this is all to the good. General readers may not realize that pasteurization is not a necessary procedure for the brewhouse, applying it or not has nothing to do with health issues as it does for certain food products including milk. It is done to ensure greater stability, to extend shelf life by preventing or at least delaying damp paper and other off-flavours from “staling” or oxidation. Craft brewers generally don’t pasteurize although there are exceptions. I always felt pasteurization does affect beer taste by imparting a slight “cooked” note, although some brewers disagree. Certainly it is nothing most people would notice. I am not against pasteurization as such as the trade-off – better quality for longer – often is worth it, but all things equal it is better that beer not be pasteurized, IMO.